Let's kick off 2015 with a KSR-inspired video: Wanderers, by Erik Vernquist. Make sure to watch full screen! The film is a vision of our humanity's future expansion into the Solar System. Although admittedly speculative, the visuals in the film are all based on scientific ideas and concepts of what our future in space might look like, if it ever happens. All the locations depicted in the film are digital recreations of actual places in the Solar System, built from real photos and map data where available. [...] As some may notice I have borrowed ideas and concepts from science fiction authors such as Kim Stanley Robinson and Arthur C. Clarke, just to name a few. 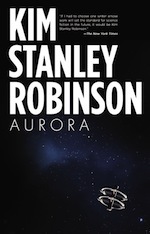 Coming in 2015 is Kim Stanley Robinson's next novel: AURORA! After taking us 300 years in the future with 2312 and 30,000 years in the past with Shaman, KSR extends further in the future than he's ever been with the generation ship-themed Aurora! The cover was revealed by Orbit Books, but click the above image for higher quality. the announcement of KSR's next novel! Stan must have a good process when our congress to writing novels these days! Im amazed at how regularly he is releasing new work. just checked the site for the first time after Amazon recommended Aurora to me (ive ordered several of robinsons books there). Hasnt any mutual fund creator gotten a clue yet? I missed this piece by KSR a decade ago. Its the only description I ve ever seen of the tool I ve been wishing existed for choosing to invest in the future. Won t someone get going in this direction? I m super excited for a new book. 2312 was and all time favorite! Unfortunately Aurora is very, very disappointing and anti space exploration.